My Netflix research this fall tells me that the rules for making popular culture and TV are changing. The cause? That popular culture is getting better and this means some of the old rules are now ineffectual and in some cases actually counter-productive. Being Human is a great case study. This is a study in fantasy and the supernatural. A ghost, a vampire and a werewolf find themselves living together and look to one another for guidance and relief. It is a show is riddled with implausibilities. Characters skip around in time and space. They morph from one creature to another. The plot lines can get really very complicated. And the viewer doesn’t care. (At least this viewer doesn’t.) The acting is so good that we believe in these characters and we are prepared to follow them anywhere. Even when the plot tests our credulity, we believe in the show. There is a second show in SyFy called Lost Girl. . This is billed as a supernatural crime drama. It too is stuffed with implausibility. Lots of fabled creatures and magical spells. For me, it’s pretty much unwatchable. And the difference is largely acting. The actors on Lost Girl are not bad. They are just not good enough to deliver the emotion truth on which narratives depend, but more to the point they are not good enough to help Lost Girl survive the weight of its own implausibility. The more implausibility contained in a narrative, the better your actors had better be. If this means spending more time casting, spend the time casting. If this means paying your actors more, pay them more. Actors are everything. Well, after the writers. And the show runners. Um, and the audience. But you see what I mean. This rule created a trade off. Very beautiful actors were chosen even when they weren’t very talented as actors. Indeed, show runners were routinely trading talent away for beauty. As a result, a show began to look like a fashion runway. Even good writing could be made to feel like something out of the day-time soaps. In a perfect world, every actress would be Nicole Kidman, perfectly beautiful, utterly talented. In the old days, when TV makers had to chose they would go for beauty even when it cost them talent. But here’s the new rule. Do not choose beauty over talent. Beauty used to be the glue that held your audience to your show. Now that work is performed by talent. It’s not that beauty doesn’t matter. Seek attractive actors. But beauty will never matter more than talent. Make sure the talent is there, and then, and only then, can you cast for beauty. Think of this as a kind of “attractive enough” principal. Stated baldly, this rule seems indubitable. What show-runner or casting agent would ever think otherwise? On the other hand, I dropped in on The CW recently and everyone seemed model perfect with bad consequences for the quality of the work on the screen. A change is taking place in our culture. And over the longer term, it will provoke a changing of the guard, a veritable migration in the entertainment industry . Actors who are merely talented will have a more difficult time finding work. And, counterintuitively, actors who are blindingly attractive will have a more difficult finding work. What used to make them effective now makes them distracting. As popular culture becomes culture, there will be many more changes. Watch this space. This entry was posted in featured, new culture, the new TV and tagged beauty, beauty-talent trade-off, Being Human, casting, casting agent, day-time soap, keynote, Lost Girl, narratives, New rules for storytelling, Nicole Kidman, popular culture becomes culture, powerpoint, rules for making culture, show runners, story telling, SyFy, talent, The CW, TV, TV shows on April 17, 2014 by Grant. I have a friend who believes every article, post, tweet he needs to read will come to him every day by new media. And he’s right. We act as editors for one another. We see something, we say something…on Twitter, Facebook, Tumbler, LinkedIn and elsewhere. But he’s wrong. I bet he misses things. I know I do. Plus, some things can’t get into new media. They just don’t. This is a classic case of the old media failing to seize the opportunities opened up by new media. Imagine how many of the shows that failed this fall season might have made it if their early fans could have got the word out. What we need is some tech overlay that makes clipping and sharing easy and possible. Build it into the remote control. Put on an IN button and an OUT button and a CLIP button and a SHARE button. I am sure there are legal issues here, but I am equally certain Lawrence Lessig or Jonathan Zittrain could sort them out over lunch time. The copy right holders are, after all, deeply incented to permit the passage of small clips. Permit? 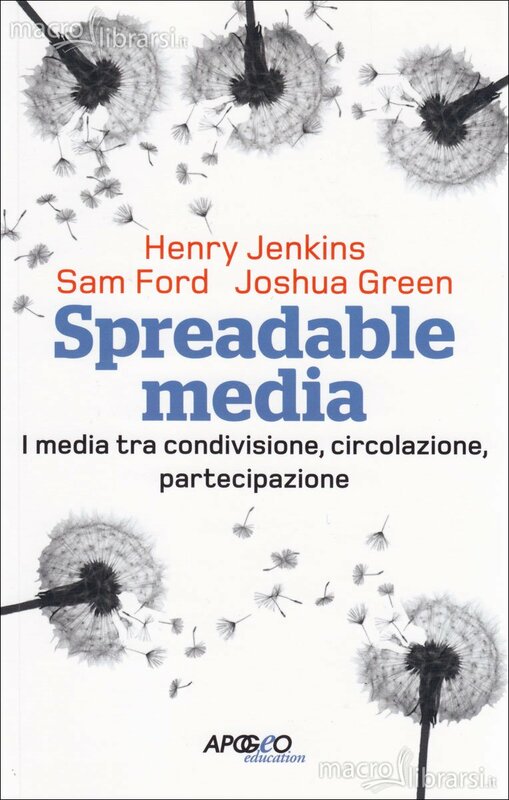 What Jenkins, Ford and Green say about spreadable media, applies especially to every new season of television. If it doesn’t spread, it’s dead. I shot this with my iPhone. Something less that stellar quality. But good enough for the internet, as they say. Some people are put off by Being Human because it’s on SyFy (they don’t like science fiction) or because the show has such a weird premise (the creatures “being human” are a ghost, a vampire, and a ghost). But I think this scene takes us beyond odd premises into the heart of the show. Several “barriers to entry” fall. SyFy wants this clip to click. God knows, we have quite a lot of content circulating on line. The numbers are simply breathtaking. But the fact of the matter is that TV preoccupies us. And it’s getting better. As it stands, this part of our culture is excluded from the conversation. This should change. This entry was posted in Uncategorized and tagged Being Human, Henry Jenkins, Jonathan Zittrain, Josh Green, Lawrence Lessig, Netflix, new media, Sam Ford, social media, spreadable media, SyFy, TV on March 28, 2014 by Grant. 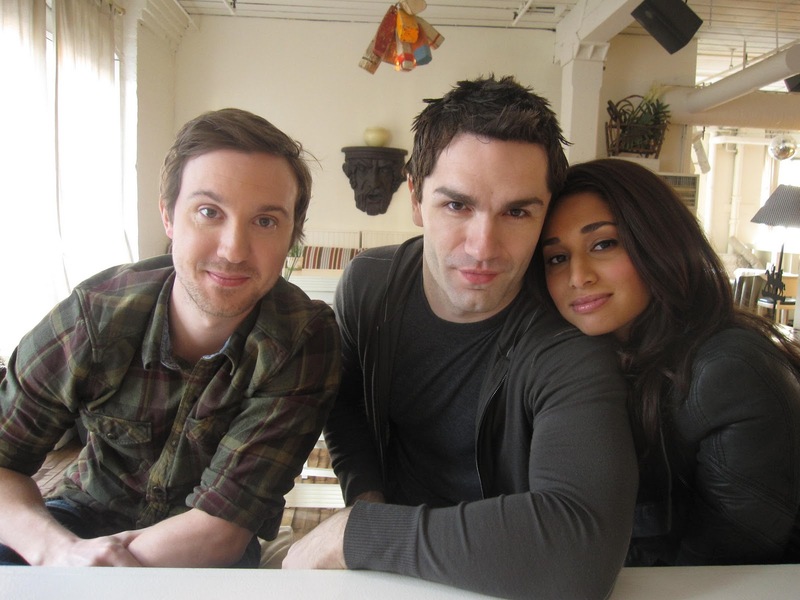 I am a big fan of Being Human, the US version, that recently appeared on SyFy. When Pam got me Apple TV for my recent birthday, I was thrilled to see that it contained BBC America and that this contained Being Human, the UK version. What a delicious opportunity to consume what Henry Jenkins calls “transmedia,” one story told in more than a single form. (I know someone is going to object that both shows are TV and this is not transmedia. Saying that British and American TV are the same medium is like saying British and American football are the same game.) This transmedia opportunity is sweetened by the fact that the media in question are transatlantic. With their special relationship, the UK and US continue to be, for certain purposes, variations on a theme. How interesting then to see what these two cultures would do with the same cultural artifact. This tells us that American TV is getting better or at least ballsier. Not to lead with beauty, or (to think of this as the trade-off it probably it was) to go with talent even when it costs you beauty, that’s a big shift for an American culture producer. The second point is harder to assess. 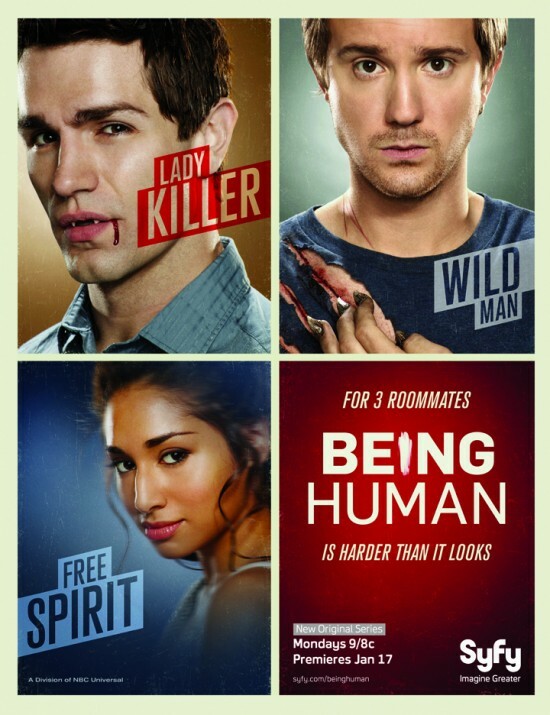 Being Human uses diversity to propel itself out of genre. By this time, we have a pretty good idea of what and who vampires are. Indeed, the genre is starting to congeal and now takes quite deliberate innovations (True Blood) to sustain life (all puns intended). Ghosts too. As a culture we have gone from having no idea what a ghost is to having a pretty clear script. (Blame Whoopi) Goldberg. Werewolves, not so much. So Being Human has a built-in “refresh” feature. Just as we are beginning to think “been there, done that” about any one of the subgenres, we are obliged to follow the story line as it crosses these subgenres. Or, less abstractly, just as we are thinking “vampires, yawn” we are obliged to watch a vampire interact with a werewolf and then a ghost. New life returns to the vampire. (ditto). And definition comes to the werewolf. In effect, Being Human is an interesting and successful TV series because it is not the product of the grammar that comes from genre. It is interesting and successful because it contains a grammar that helps it escape genre. It is not generated but generative. Being Human contains the secret that characterizes all the culture we care about these days. It is both familiar and unpredictable, both from genre and beyond genre. This entry was posted in Uncategorized and tagged American TV, BBC, BBC America, Being Human, genre, grammar, Henry Jenkins, SyFy, transmedia, TV, Vampires on April 4, 2011 by Grant. I watched the opening episode on Being Human on SyFy this week. The fun thing about science and fantasy fiction is that you never know which of the assumptions that govern your world will be reconstituted in the present one. And even once you’ve spotted the difference(s), it’s still hard to anticipate what differences the difference(s) will make. This is distinctly the pleasure of Being Human. You can’t guess, beyond the obvious things, how vampires, werewolves and ghosts will coexist, and its fun to wait to see this play out. The ghost (and the actress who plays her, Meaghan Rath) is especially interesting because she is still figuring out how to be a ghost and divides her time, in the meanwhile, between being a busy body around the house, and wailing, properly, at the sheer injustice of her fate. Shake well. Repeat as necessary. Putting a vampire, a werewolf and a ghost in a house is interesting. Putting this vampire, werewolf and ghost even more so. It’s not that this has ever been for me a matter of burning curiosity, as in “I wonder what would happen if…” But it makes a diverting pretext on which to sharpen on our wits. Because we don’t just sit there. We are Jenkinsians. We are hunting and gathering the simple where, what, and who. We are also working out the back stories. (It turns out the werewolf is Jewish and that woman we thought was his girlfriend is actually his sister. To know something about this family makes what we may think about his identity as a werewolf richer and more interesting. I mean, otherwise, he’s just a one trick pony, er, werewolf.) And we are performing a kind of cultural Sudoku. If this is true, and this is true, we tell ourselves, then this is probably true. 5) Has the world been successfully jumbled? Have things been brought into collisions that are normally kept asunder, and does their combination deliver present, and promise future, interesting, outcomes? 6) Oh, there’s a 6th. I think we are looking at each of these characters and asking "what would it be like to be like that?" 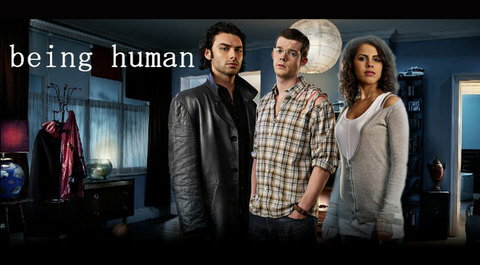 This is the unofficial viewer’s guide with which I watch Being Human and probably any show. We are active viewers, digging, poaching, reworking, creating, empathizing, as we go. Jenkins, Henry. 1992. Textual poachers: Television fans & participatory culture. New York: Routledge. Jenkins, Henry. 2006. Fans, Bloggers, and Gamers: Media Consumers in a Digital Age. NYU Press. Jenkins, Henry. 2008. Convergence Culture: Where Old and New Media Collide. Revised. NYU Press. Jenkins, Henry. 2009. Confronting the Challenges of Participatory Culture: Media Education for the 21st Century. The MIT Press. Post script: I hope Henry, my esteemed colleague, will forgive me taking liberty with his ideas and his name. This idea was buzzing around in my head, and I had a 50 minutes to turn it into words on the train. This entry was posted in Uncategorized and tagged Being Human, ghost, Henry Jenkins, Jenkinsians, Meaghan Rath, SyFy, vampire, werewolf on January 19, 2011 by Grant.